The landscape’s reputation was bolstered further by Bollywood movies such as Kashmir Ki Kali (1964) and Jab Jab Phool Khile (1965). Featuring a complicated subplot of kidnapped babies and mistaken identities, Kashmir Ki Kali is primarily remembered for the romantic pairing of Shammi Kapoor and Sharmila Tagore, playing a young and brash businessman on a visit to his bungalow in Kashmir and a local beauty, respectively, who fall in love amid the lush countryside. 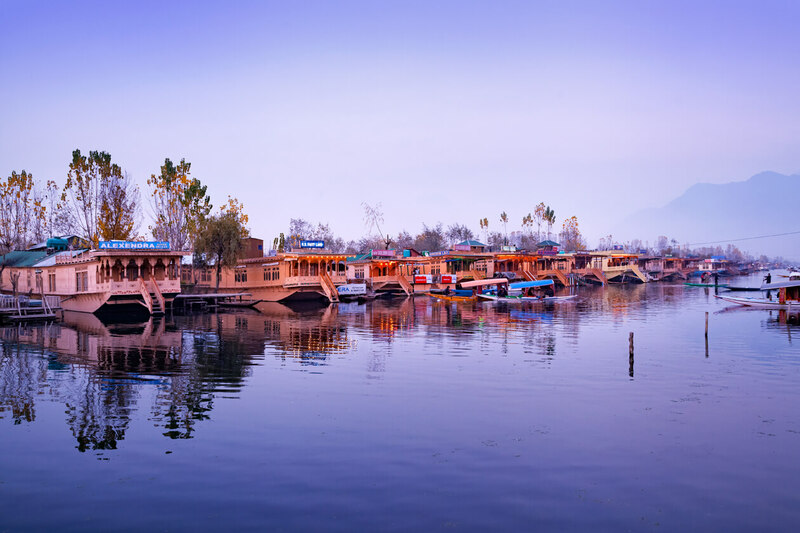 Its song “Yeh Chand Sa Roshan Chehra” is popular for highlighting Kashmir’s bounties, such as the famous floating market on Dal Lake. Jab Jab Phool Khile flips that script, with leading lady Nanda playing a rich heiress who, upon her return from America, visits Kashmir and falls in love with a poor houseboat owner played by Shashi Kapoor. It included songs such as “Pardesiyon Se Na Ankhiyan Milana,” which again highlighted Kashmir’s nature vistas. More recently, however, Kashmir has had a different reputation. A source of contention between India and Pakistan for more than seven decades, Kashmir became home to a militant insurgency in the late 1980s and is now one of the most militarized zones in the world. Its beauty and the lives of those living in the region are, in many corners of the world, largely forgotten. Many in Canada only see snapshots, such as in 2016, when clashes between the Indian army and civilians protesting the killing of populist militant Burhan Wani made headlines across the globe. Armed forces used shotguns to fire metal pellets, and left thousands of people, including many children, wounded or blinded. In these days of an unceasing news cycle—most of which is grim—there can be an impulse to quickly scroll over yet another image of a young child in distress in our Facebook feeds and Twitter timelines. Truth, after all, can be hard to bear. But, in spite of this reality, it’s fiction that can offer us an opportunity to empathize. Recent novels by authors Pasha Malla, Arundhati Roy, and Mirza Waheed have brought readers back to the region without shying away from the conflict. They allow us a window into fictional—yet no less truthful—lives of people in Kashmir. These novels look beyond the statistical reports, such as the number of casualties in the latest round of assault, and instead offer complicated narratives of a paradise lost. Before he published Fugue States, Pasha Malla rarely spoke publicly about Kashmir. Malla says the topic usually came up in more intimate settings, such as when he was ensconced in the back of a cab, being shepherded across a Canadian city by a South Asian taxi driver—more specifically, an Afghan, Pakistani, or north Indian cabbie. “When I mention Kashmir to South Asian cab drivers, it usually inspires involved and interesting conversations that take me well past the destination,” Malla says. “Invariably, the first thing they say is, ‘Most beautiful place in the world.’ Well, yeah, except for the mass graves and total decimation of culture, it’s really pretty.” But Malla’s conversations about Kashmir have inevitably increased since the publication of his second novel, released last May, which is partially set in the Himalayan region. In Fugue States, Ash Dhar, a writer turned radio host, is dealing with the untimely death of his father, Brij. Ash discovers what seems to be a manuscript written by his father and set in Kashmir. Although he’s curious about the book, Ash has no interest in a clichéd journey to a troubled land to deal with his father’s death. Instead, it’s his friend Matt who becomes inspired and books a flight to India. A series of misadventures follow, and Ash has to reluctantly rescue his friend. But during a flight to Srinagar, en route to a four-day ski trip in Gulmarg, Ash goes into a fugue state and suffers from a sort of amnesia: he forgets his name, what he does for a living, and why he’s in Kashmir with a man claiming to be his childhood friend Matt. A child of a Kashmiri father and a British mother, Malla grew up not speaking Kashmiri, and before a trip in 2014, he had not visited his father’s ancestral land since the early ’80s. Malla had some initial concerns at first about writing a novel set in the region. There was the tricky issue of representing a conflict zone when others were writing accounts of their own lived experiences. Malla says that he also didn’t want to give into the expectation—both internal and external—of writing the sort of book that seems to be required from a child of immigrants: a journey of self-discovery while looking for roots in another land. “It was as much a reaction to the way South Asian writers are commodified,” says Malla. “Participating in the mechanism made me uncomfortable.” Nevertheless, the tension between his identity and his active resistance to writing from that point of view intrigued Malla. The character of Brij is loosely based on Malla’s father, Ashok, who left Kashmir and moved to England and, later, Canada. The family visited Kashmir regularly until the early ’80s, after which travelling back became a dangerous proposition. Growing up, Malla knew Kashmir was an important place to his father. “He had this specific idea of a Kashmiri identity, which, even as a kid, I knew was different from an Indian identity,” says Malla. Those looking for further explorations of the complicated question of Kashmir may be disappointed. The region’s political turmoil isn’t central to Fugue States—its main theme is a critical look at contemporary masculinity highlighted by the complicated relationship between Matt and Ash. But the regional conflict does come up in certain scenes, including those which feature Dr. Sayeed, a Kashmiri local Ash meets at a gathering, who is terrorized by different groups around him—“state police, BSF, Indian army, militants.” His wife and son are later murdered by militants. Though fictional, such stories are all too common in real life. Arundhati Roy believes that fiction is the only way of telling the truth about Kashmir. At the Toronto launch for her latest novel, The Ministry of Utmost Happiness, Roy mused on the act of writing about the Kashmir conflict, which has been going on for decades. 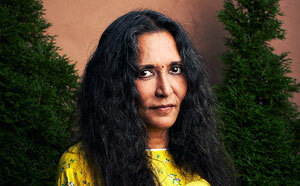 Known for her beautifully caustic non-fiction writing, through which she regularly questions those in positions of power and has taken on topics such as the Indian army’s occupation of Kashmir, Maoist insurgents in central and eastern India, and the United States’ role in the wars in Iraq and Afghanistan, Roy said that fiction allowed her to tell a story that cannot be told through reportage. The Ministry of Utmost Happiness is a sprawling book with many characters whose lives intersect at various points of the narrative. One of those characters, Tilo, is, like Roy herself, an outsider who studied architecture. At school, she meets three men: Garson Hobart (a nickname that becomes important later on in the novel), Musa, and Naga. Garson goes on to become an Indian intelligence officer working in an outpost in Kashmir, Musa a Kashmiri militant, and Naga a journalist covering the region. Their lives come together again after Tilo is captured in Srinagar by a military officer with a penchant for torture. She’s taken to Shiraz Cinema, a former movie theatre now serving as an interrogation centre, where she sees a horde of young men beaten up and bound. Frightened and surrounded by instruments of torture, Tilo desperately uses Garson’s name to keep her interrogators at bay. Speaking to a packed house at Bloor Street United Church in Toronto, Roy said that part of what she wanted to explore with her book was the ongoing standoff between the Indian army and the Kashmiri people. “What happens in twenty-five years of militarization? What happens to people, soldiers? What happens to soldiers meant to celebrate atrocity?” she asked. Although Waheed spent a decade with the BBC’s Urdu news service covering South Asia, including Afghanistan, Pakistan, and India, he says that fiction gave him a chance for deep dives into the complexity of conflict that could not be addressed in a two-minute TV bulletin. “You can’t do nuance when you’re doing news,” he says. Waheed’s career as a journalist helped when it came to trying to parse those experiences while writing The Collaborator, as well as his second work, The Book of Gold Leaves. While writing these novels, he thought back on the terminology and soundscapes that marked his youth. What exactly was the Indian army cracking down on? How do you get the ability to tell the difference between a gunfire from a Kalashnikov versus a Karabiner? As a fiction writer, he didn’t feel it was his job to tell the world about Kashmir as some sort of spokesperson; his goal was to create a world where he could ask questions he didn’t know the answers to. And while he still writes long features for outlets such as the Guardian, he says that fiction may be a way to get at a truth that the facts sometimes don’t add up to. “There’s more truths that you can uncover through the lies in your fiction,” he says. Like the works of Malla and Roy, Waheed’s novels give readers a chance to indulge in the pleasure of reading but also get them asking the question, How did we come to this?